Photos by Andrew Trant (bottom left) and Kelly Fretwell. Dwarf blueberry is a spreading, dense shrub up to 30 cm tall. Its leaves are bright green with distinct teeth along the edges and clear veins on the underside. They grow in alternating pairs up the rounded branches. Often oblong or lance-shaped, the leaves are 1-3 cm long and blunted at the tips. The flowers are small, pale pink, and urn-shaped. They generally curve downward and are approximately twice as long (4-6 mm) as they are wide. The fruits are edible: dark blue to greyish blueberries that bloom between July until September. Dwarf blueberry grows from Alaska and the Yukon down into Oregon. It is found in a huge range of habitat, from low to high elevation, in the understorey of woods and open forests to open fields and bog. It prefers well-drained, slightly acidic soil in moist conditions. 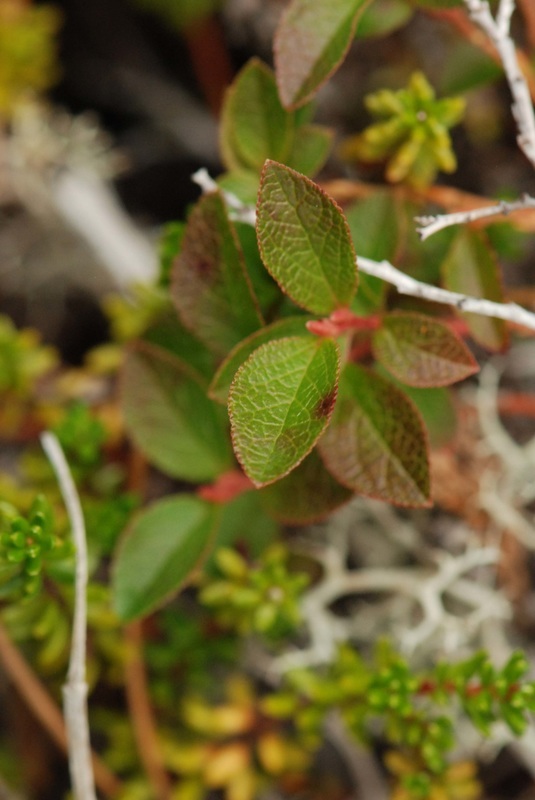 Bog blueberry (V. uliginosum) is found in similar habitats and reaches approximately the same size as dwarf blueberry; however, its leaves are shorter and broader with smoother edges and a duller green-reddish coloration. Oval-leaved blueberry (V. ovalifolium) is a larger shrub overall, and bears pinkish-white urn- to egg-shaped flowers that usually appear on the plant before the leaves. 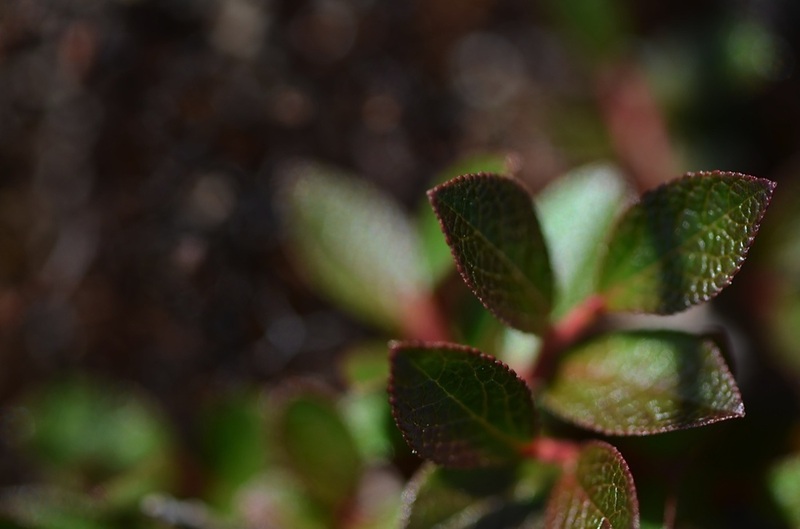 Alaskan blueberry (V. alaskaense) is also larger, and has bronze to pinkish-green flowers. Dwarf blueberry is a traditional food source of nearly all First Nations groups within its range. Traditional management of this and other blueberry species involved controlled burning to stimulate growth. Pojar, J. and MacKinnon, A. (1994). Plants of Coastal British Columbia. Vancouver, BC: Lone Pine Publishing. P. 58. 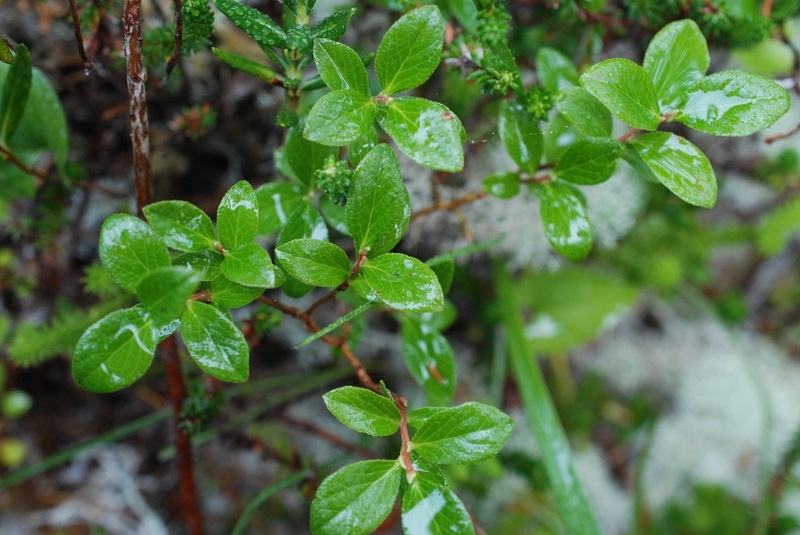 Vaccinium caespitosum. Non-Timber (NT) Quality Codes. Centre for Livelihoods and Ecology, Royal Roads University, Victoria, BC. Accessed 22/08/2014. Vaccinium caespitosum Dwarf Blueberry "Dwarf Bilberry. "﻿ Common Shrub Species of the Northwest Forest. Boreal Forests. Faculty of Natural Resources Management, Lakehead University, Thunder Bay, ON. Accessed 22/08/2013. Vaccinium caespitosum Michx., orth. In Klinkenberg, Brian. (Ed.). E-Flora BC: Electronic Atlas of the Plants of British Columbia. Lab for Advanced Spatial Analysis, Department of Geography, University of British Columbia, Vancouver. Accessed 22/08/2014.